At many airports you can wrap your luggage with sheets of sticky plastic. Why on earth would you do that? I only see disadvantages. I can imagine the mess when customs ask you to open your luggage. So what benefits am I missing? You don't want your expensive luggage to be scratched! I remember seeing this at an airport once before. They didn't have this at my local international airport so I thought it was some crazy thing for paranoid fliers. But in hindsight it has a purpose. The companies go on to suggest that you can also prevent scratches, wear and tear, and other such things. I find it hard to believe a thin layer of plastic could do that, but it probably does provide some degree of protection from those too. The most convincing however, is the protection from Weather. The tarmac where the plane is loaded isn't protected from these things. If I have fabric luggage, I can use these wrapping services to prevent rain, mud, or frozen winter gunk from getting into or on my luggage. Possibly damaging it permanently. An interesting note. When they wrap the luggage, they often times cut out the wheels, if a pull/push/rolling set, and also some of the handles, so even though it is wrapped up you can still use it like you had. Also the device they use, for anyone who hasn't seen this, is an interesting combination of a kiosk and warehouse skid wrapping machine. Plastic wrap, or some sort of net, is also a common technique for people traveling with backpacking packs. The number of protruding straps, handles, etc. are irresistible bait for baggage handlers or machines to grab your bag by the wrong strap and rip it apart. Bundling it until it reaches your destination prevents backpack disabling misadventure. It prevents anyone in the airport from stealing anything from your bag. Not a problem in many European/USA airports, but when travelling through, say, Africa, you have to be careful. I remember a friend of mine, after transferring through Johannesburg, picking up her laptop case from the luggage carousel and remarking that it felt very light. Shrinkwrapping your luggage also protects anything protruding or attached such as handles, straps, fittings, padlocks, wheels, etc. I agree with most of the answers, but don't think that if your luggage is wrapped in plastic it can't be "opened by accident". I have a friend who traveled from the US to Venezuela with his luggage wrapped in plastic, and some things "dissapeared" from his luggage, aparently someone opened it got some stuff and wrapped it again in plastic so my friend didn't notice at the airport. I don't mean to scare you with this, what I mean is that if wrapping lugagge in plastic doesn't give you that much security. Besides, if the security guards at the airport ask you to open your luggage for a security check you'll lose more time and money. I assume people do that because they are afraid someone could easily hide some illegal substances in unattended, non-wrapped baggage and try to steal it back on the other side, after the victim passed the luggage inspection. to make the luggage as compact as possible. No you don't lose or waste anything when asked to open your luggage. All the customs I went through that asked me to open my luggage had very heavy-duty sticky tape with which they put it back again. No problem! I am from South Africa. The wrapping is not expensive and I do it for two reasons. Protection and protection. I have also used the wrapping service to tie together two pieces of luggage so that they would count as one. I had two soft duffel bags to check-in but my fare allowed me to check-in only one item. Since their cumulative weight was inferior or equal to the allowed weight I wrapped them together and thus checked-in only one piece of luggage in the eyes of airline staff. Here in Colombia, drug dealers often put cocaine in people's luggage when is handled by baggage handlers. When they arrive to destination in Europe or USA, the local baggage handlers remove the cocaine. However sometimes the police discover the drug, so the innocent luggage owner goes to jail for drug dealing. So wrapping your luggage in plastic may prevent it. Also if your luggage arrives without plastic, but with cocaine inside. you might try to persuade the police that you are indeed innocent. For safety reasons, to protect your bag from scratches and liquid that could come out of other bags. For safety reasons again, if you travel in not-so-safe destinations, airport staff might open your luggage before delivery and steal stuff. For safety reasons, so that people can't put drugs in. For safety reasons, backpack straps could get stuck in the luggage management system. I live in Venezuela. It prevents anyone in the airport from stealing anything from your bag, but in airports like there are in Venezuela, it's not a warranty that method works, because workers inside the airport have this kind of machine too. And security personnel, it means National Guard are corrupts and know this situation but are paid by these kind of workers. Besides, if the National Guard ask you to open your luggage for a security check, you'll lose your money. Australian baggage handlers and customs officers are currently (December 2012) being charged with smuggling drugs and guns into Australia through other people's luggage. They slip items in and they come out, as organized at the other end of the journey, and the owner of the luggage has no idea it has happened - until they get told their luggage has come out on a swab as being tainted with a drug that they've hardly even heard of. If you arrive at the airport to find your luggage slightly broken, the luggage wrapping service will be a good solution. It is a better solution that buying a new suitcase in the airport. Reference: How to dispose of a broken suitcase at an airport? 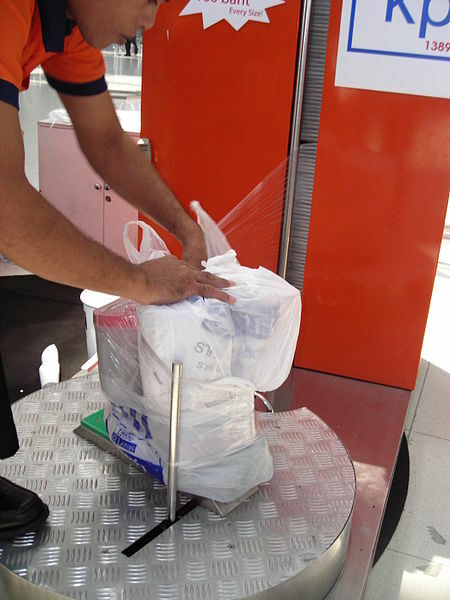 On my recent trip to Oman, I saw such a shrink-wrapping service for the first time, presumably because it is not placed nearly as prominently on European airports (I fly mostly from AMS, DUS, CGN, and I have to yet find it there). During the thirty minutes that I watched the process at Mascat Airport (MCT), it was not once used to wrap suitcases. Instead, mostly Indian/Pakistani/Bangladeshi expatriate workers queued, with cardboard boxes, plastic shopping bags and other "unusual" kinds of luggage that urgently required wrapping to not disintegrate on the luggage belt or the apron. And I guess paying 100bz (20cent) for wrapping per trip will indeed save them much money compared to a OMR 40 ($80) suitcase that they have to store somewhere between the trips. A lot of people answered, but here is another reason. Its to make sure your item isn't damaged or opened while loading/unloading. 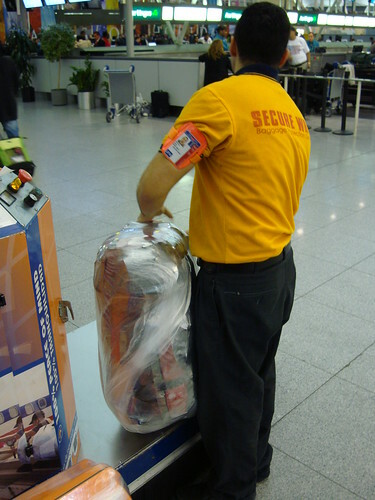 Some airlines will refuse to check your luggage if its not wrapped correctly. During a recent trip, I was told to wrap a wheelchair in this plastic cocoon before the agent would accept it. Looks like there might be a new reason for doing this. Some international flights are now restricting your checked luggage to one, not two bags, and might cause a fuss when you turn up. Airlines are cutting corners wherever possible these days, and one of those ways is lowering the amount of allowable check-in bags. Whereas it used to be quite normal to just expect two check-ins as a given on an international flight, that’s not guaranteed anymore. That cheap flight you booked, saving yourself a few hundred, might only allow one check-in. Extra bags after booking the ticket might be around $150, or as much as $250 if you do it at the check-in counter. That’s where the plastic wrapping comes in. If your bags are small enough, take them over to the wrapping station, and for about $15, it’ll turn two bags into one. You’re not breaking any rules by doing it, and sometimes the check-in attendants will even recommend it. If one of your bags has an extendable handle and wheels, they can even wrap it so you can wheel around both bags on the one set of wheels. Bonus! How bad is baggage theft at Johannesburg airport? How to dispose of a broken suitcase at an airport? How do you weigh luggage ? Why do luggage carts cost money to use in U.S. airports, but are provided free of charge in other places?